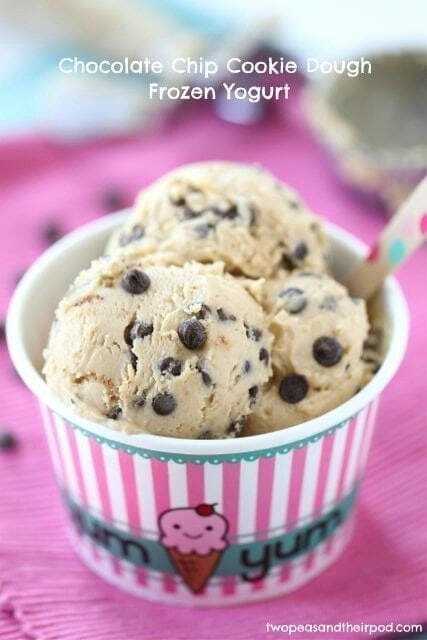 To make the frozen yogurt, you whip up a little eggless chocolate chip cookie dough and stir in yogurt. I used Chobani 0% vanilla yogurt. You let the frozen yogurt hangout in the freezer until frozen and that is it! The results are a creamy and dreamy frozen yogurt that tastes just like chocolate chip cookie dough. 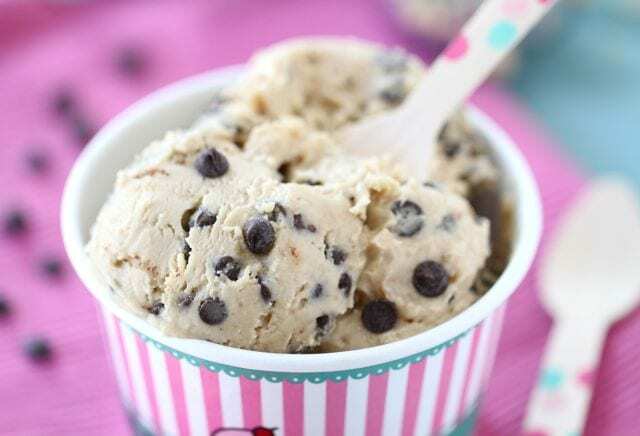 Cool off with a big scoop of Chocolate Chip Cookie Dough Frozen Yogurt. And if you go back for a second scoop, I completely understand:) For the recipe and step-by-step photos, visit Tasty Kitchen. Thanks Anna for sharing your fabulous recipe! where do you buy those cups? This looks as rich as creamy ice cream! I love the cup and spoon too! I HAVE to make this for my kids, they would love it! This would be so dangerous for me. 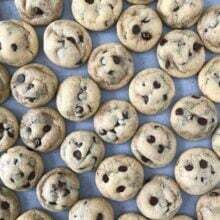 I have this thing about cookie dough (especially chocolate chip cookie dough). I totally lose restraint and control. I will eat it until I have a tummy ache! I don’t do that with anything else but cookie dough. So suffice it to say, this looks amazing and great job but it’s WAY to dangerous for me. I will enjoy it vicariously through you. I have been freezing my yogurt n the freezer all summer. About an hour or two and you have creamy frozen goodness! I love it!!!!!!!!!!! Maria, this looks amazing!! I am in LOVE with those little ice cream cups too. I need to make this. Today. 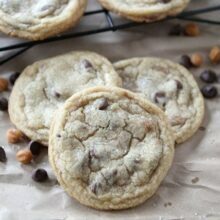 cookie dough in any or all forms is something I will ALWAYS need in my life – looks awesome! CHO-m-g! Your version of frozen yogurt is like nothing we’ve seen before! Thanks for keeping us in mind when whipping up this sweet treat. Email fans[at]chobani dot com so we can get some fresh ‘gurt your way! Oh my dear me. I have ice cream planned today and this looks amazing! That looks so delicious! And perfect for summer (oh who I am kidding? this would be perfect any day of the year)! Thanks for sharing! It looks refreshing and yummy! It’s like the cookie dough and the yogurt cancel each other out. Oh my, this looks amazingly perfect!! I think I could definitely eat this by the gallon! My 2 year old and I are drooling over this right now. Looks amazing and I love healthy desserts. Yum! What?! This is too good to be true!!!! Oh yum Maria!! 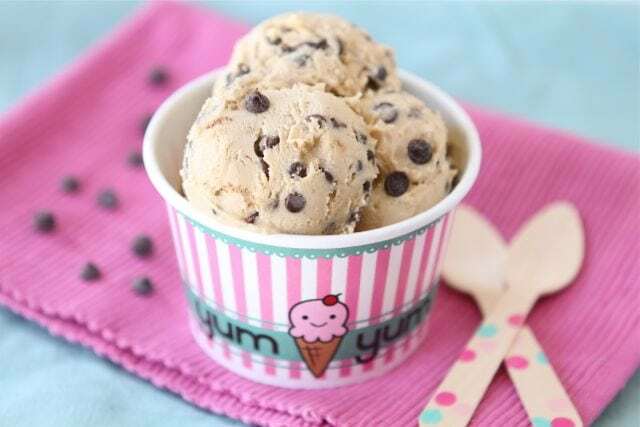 Chocolate Chip Cookie Dough is the best!! Oh. Em. Gee. I’m freaking out over this Maria! So making some of this for the weekend. Love! Oh my word. I have to make this pretty much yesterday. Cookie dough anything is always the kiddo’s favorite. 🙂 Can’t wait to try this!! 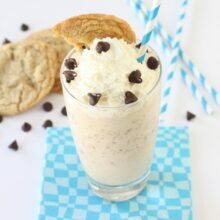 Considering that chocolate chip cookie dough is one of my most favorite ice cream flavors EVER, I NEED to make this, immediately! It looks so easy! Wow does this look amazing – the perfect treat for these last dog days… love those super-cute cups as well! Happy weekend! This is so deliciously brilliant! Love it! I am beyond thrilled that you made my chocolate chip cookie dough frozen yogurt and love it so much, Maria! Thank you for the kind words and the linkage! This looks so good – but does it kill the bacteria in the yogurt to freeze it? Chobani is our yogurt of choice too – so good! I stick mine in the freezer a few minutes but don’t want to lose the bacteria but even w/o it I will have to make this because it looks so yummy! It’s in my freezer right now! I can’t believe I am going to have to wait till it’s frozen aarrghh… 😉 It looks delicious! It does sound a little too (dangerously) easy!! I’m curious…need to try it! Mmm such a treat! Anything cookie dough sounds awesome to me! I made this yesterday and it’s very good and very rich. The only change I made was subbing rice flour for the regular flour to make it GF. The only kind of “weird” thing though is that it doesn’t melt. The kids didn’t finish their bowls and left them at the table. A few hours later I went in to clean up and there they were, still formed, not melted. Kind of freaky. I made this today and am eating it right now and it’s SO YUMMY!!! So glad you liked the fro yo! This is just beyond….beyond…..what else do I say? this looks amazing. and can we talk about that cup & the pictures? so stinkin cute! This is my summer dream come true! Oh YUM! And so easy, too! And I wouldn’t feel guilty because it’s yogurt! win-win! This looks so heavenly, Maria! Oh wow – what a great idea! I have an ice cream maker, but I’m always quite content to keep it tucked away. Must try this! I made it – it is delicious. Very sweet but a great treat. Any other flavor recommendations? I’d like to experiment! oh my goodness, I want a HUGE bowl of this right now! This looks so easy and amazingly delicious. Can’t wait to try it! I saw when you posted this on TK. Looks amazing! It is hot and I need this. The cups are precious. Are they on-line?? Made this a couple days ago and tried it last night. My daughter didn’t like it and my son didn’t finish his. I finished my small helping, but it is very rich and not sure I”ll make again. This sounds amazing! How much of the yogurt did you use though? One of the bigger containers or the single serve ones? Thanks! Hi! I made this the other day and loved it but it got too hard to scoop! I had to saw it out with a knife and ate it like cookie dough instead of ice cream. I checked my freezers temp and it was set at the recommended temp so I don’t know what happened. Any advice? Thanks! This looks so good! I do wonder how people think its healthy though, lots of sugar between the dough and the yogurt . I think I’ll try Chobani nonfat plain yogurt. Can’t wait!!!! fyi: NOT A LOW CALORIE DISH!!! after tallying up the cals for the ingredients and using and estimate of a 1/2 cup serving size (which is a SMALL serving) its comes out to about 680 calories per serving, thats more than an entire pint of ben and jerry’s fish food ice cream! !…….just saying, if you were eating this for the purpose of it being diet friendly, IT’S NOT. I am a fan already although I haven’t even tried it. Yet! I definitely will. And hopefully soon. Thank you for this recipe! Great idea! But how much yogurt? Would this work if you just bought plain chocolate chip cookie dough from the store and then added the yogurt? I am just wondering if I could make it easier. We have made this, and it is sooooo good!!!! It’s easy and a nice summer treat!!!!!!!! Tried this cookie dough yogurt and loved it! Does anyone know how many calories are in a serving of this? I know this is a little late but I just happened upon this recipe because me and my husband are frozen yogurt fanatics. I made this on Friday night with the intentions that it would freeze over night and we would eat it for dessert on Saturday. I woke up Saturday morning to find it half gone. Needless to say- my husband LOVED it. 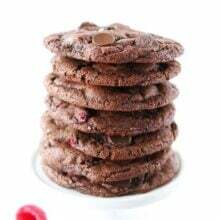 I used a few more chocolate chips than the recipe calls for because we love them and it came out fantastic! Definitely a recipe I will be using over and over again! Could not recommend this. Two adults, two kids and no one enjoyed it and the kids left the table with their bowl still full. It is hard to pinpoint the “problem” but I think it may be mixing the cookie dough together with the yogurt. I think the different textures on your tongue with real ice cream with cookie dough chunks mixed in is too hard to beat. This doesn’t even melt, stays rock solid. I’m glad I gave it a shot, it is more “clean” than the store bought ice cream with trans fats and loads of unpronounceable ingredients. I have made this several times and it is so good. I made it just this week. Love this! This looks really great, I should try it !